An outstanding modern take on a traditional farm house situated in a charming semi-rural location with paddock and countryside views. The property offers bright,versatile and well-proportioned accommodation individually designed to make the most of the wrap around established gardens. The property is ideal as a family home and lies in catchment to excellent Cambridgeshire Schooling. 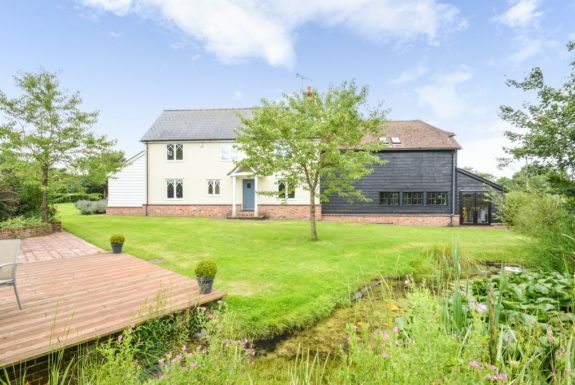 Set in 2.2 acres is this exceptionally presented four bedroom (two en-suite) single storey property has been comprehensively refurbished and occupies a semi-rural setting. Benefits include a double garage, ample parking, large garden with open views and equestrian facilities. 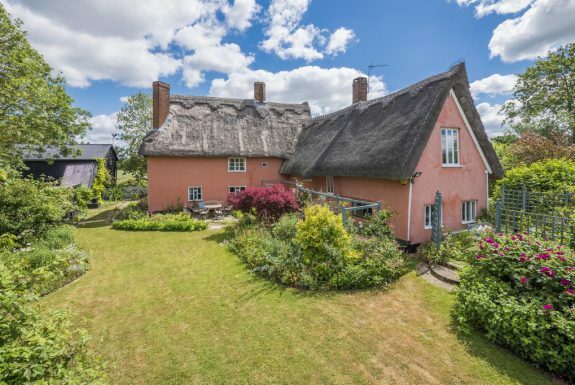 Dating from the 16th Century, this charming and characterful timber-framed thatched farmhouse contains multiple period features including open fireplaces, exposed timbers, mullion windows and brick floors. Boasting its attractive and archetypal Suffolk pink exterior, the house can be seen set well back from the road on a quiet country lane. It is surrounded by open countryside, and therefore benefits from far reaching rural views. 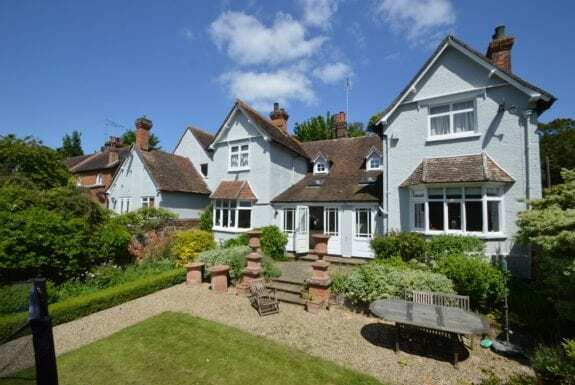 Other notable features include extensive and well maintained grounds, making for delightful formal gardens, as well as two generous outbuildings, one of which is ideal for conversion to residential accommodation, office, studio or other use, subject to the relevant planning permissions. This exceptional period house occupies a prominent position on the village green enjoying one of the iconic views of Suffolk. The well proportioned living space offers considerable character and is complemented by a guest cottage, cart lodge, off road parking and large walled garden. This outstanding village house offers the best of both worlds, centrally located and well placed for the village shop, pub, church etc. The large grounds that extend to approximately 3.5 acres and abut a river which provides the perfect rural countryside background. The house has extensive character (mullion windows, wide oak floorboards, high beamed ceilings etc) and is further complemented by a triple bay cart lodge, workshop and parking. One Pembroke Farm is a delightful, substantial and well-designed five bedroom detached property occupying a sizeable plot and is situated in one of the area's finest villages. Offering well-presented accommodation throughout, the property boasts an abundance of impressive and versatile rooms, all of which measuring in excess of 3,000 sq.ft. 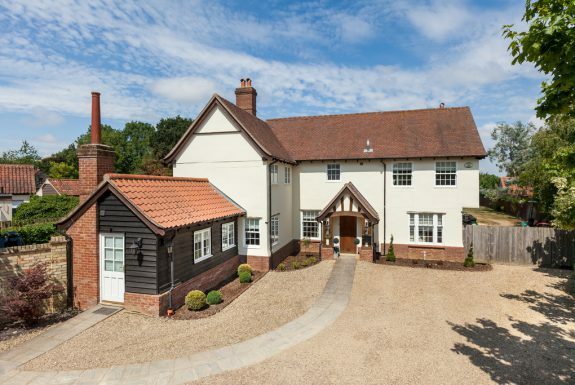 A particular asset to the property is the detached timber framed building which on the first floor offers a self-contained annexe whilst the ground floor adds a double carport, store room and a gym. Externally enjoying a gravel driveway providing parking for several vehicles, a spacious rear garden and a separate paddock. In all about 1.1 acres. A five bedroom (two en-suite) detached contemporary residence offering 4,145 sq ft of living accommodation and enjoying four reception rooms. 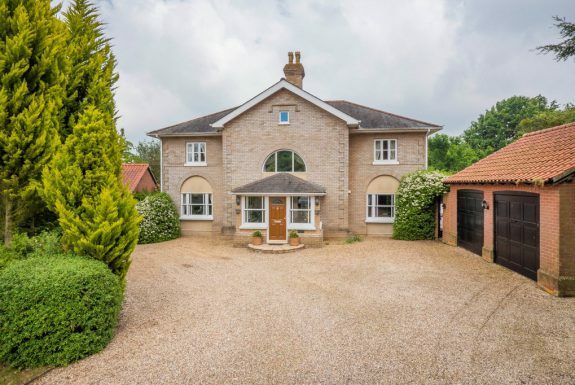 Further benefits to the property include a self-contained annexe, double carport, double garage and gardens with a total plot size of approximately 0.46 acres. This outstanding attached proportion of a country house occupies an exceptional position amid open Suffolk countryside. The house has undergone a meticulous programme of sympathetic restoration by the current owners and now provides elegant accommodation complemented by outstanding grounds. 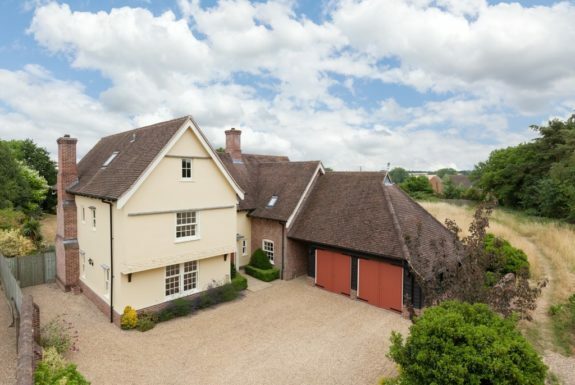 This instantly recognisable Grade II Listed detached period building has recently been refurbished by the current owner and is located in the heart of Long Melford. In the past the premises has provided for a successful restaurant business and is currently home to a thriving art gallery. Ample parking and generous garden. This exceptional 3,800 sq ft detached property is situated in the heart of the village in a quiet, tucked away location. The property has been thoughtfully extended and updated in recent years to create a stylish and comfortable home blending high quality finishes with character features, all set within mature gardens with plenty of parking, garaging and an impressive covered entertaining area to the rear. 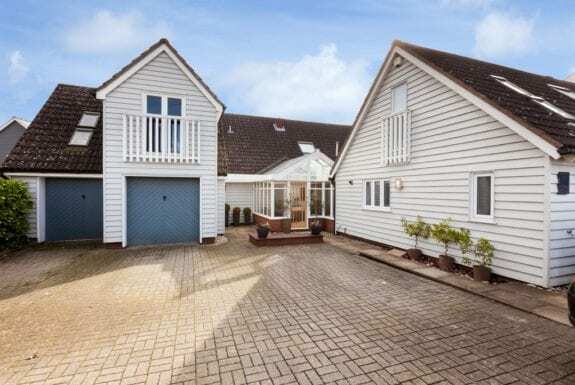 This contemporary detached home has been meticulously extended and updated by the current owners to provide a home of immense style and character. The property, which offers over 5,000 sq.ft of accommodation, offers a flexible layout and has been finished to a high specification incorporating a self-contained annexe and a heated indoor swimming pool with the added benefit of plenty of parking and large gardens backing onto open countryside. In all about 0.41 of an acre. This substantial detached house was originally built in 1878 by a Jobe Grover Esq. and since that time the property has had a number of colourful and interesting owners. In more recent years, the property has been sympathetically enlarged to provide over 5100 square feet of accommodation on 3 floors. This outstanding barn conversion is exceptionally well-presented with versatile accommodation that would suit a range of different lifestyles. The property offers considerable character (exposed beams, brick floors, fireplaces etc.) and is further complemented by ample parking and a generous private garden. No onward chain. A substantial and versatile house in a semi-rural location which has an excellent adjoining annexe wing or could be incorporated into one main house. Large outbuilding incorporating stables, tack room and garage. In all about 3.8 acres. 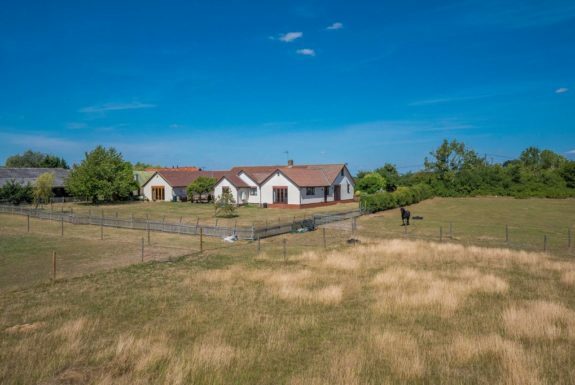 An impressive detached single storey dwelling including annexe wing offering substantial accommodation of approximately 3900 sq ft with equine facilities and grounds approaching 9.5 acres. A Grade II listed 16th century four bedroom (one en-suite) detached property offering accommodation in the region of 2,935 sq ft Benefits include a detached one bedroom annexe, a triple garage, off-street parking, tennis court, gardens, paddock and total plot size of approximately 1.8 acres. An impressive Grade II listed village home enjoying a central location within walking distance of the amenities offering extensive family accommodation with fine period detailing throughout. Partially walled South & West facing gardens and coach house. In all about 0.8 acres(sts). Potential for self-contained annexe accommodation. A unique opportunity located in the heart of one of East Anglias most highly regarded villages. The exceptionally versatile accommodation is very well-presented and is further complemented by extensive parking, double cart lodge/garage and outstanding garden. In all about 0.27 acres. An imposing village house built in a Georgian style offering impressive and versatile family accommodation arranged around a striking reception hall. Partly walled South facing gardens, extensive post and railed pasture and detached double garage. In all about 2.2 acres(sts). A handsome Edwardian property offering elegant and well-proportioned living accommodation set in a sought after village location. The property has retained many original character features such as decorative ceiling roses, cast iron radiators, open fireplaces and decorative picture rails, whilst also benefiting from a stylish shaker style kitchen and modern luxury bathroom suites. There are front, side and rear gardens, ample parking and a double garage. In all about 1 acre. This stunning Grade II Listed detached farmhouse is situated in a quiet, tucked away position overlooking open countryside. 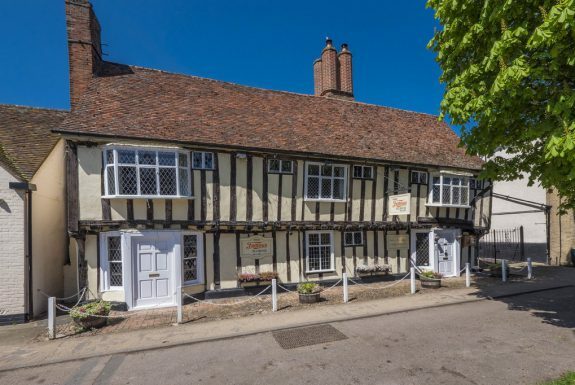 Dating back to 1557 the property has retained many original period features including heavy oak timbers and inglenook fireplaces complemented by a modern farmhouse kitchen and luxurious bathrooms. 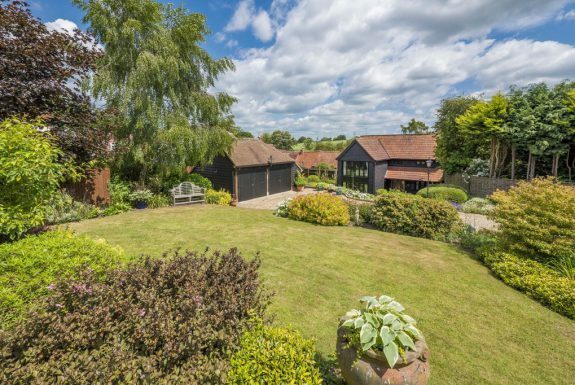 The property sits in large mature gardens incorporating a range of useful outbuildings and garages. In all measuring about 0.5 of an acre. This spacious detached house occupies an elevated position and in turn enjoys far reaching field views. The versatile accommodation combines character (wide oak floorboards, exposed beams, fireplaces etc) and is further complemented by a double garage, extensive parking and generous gardens. In all about 0.8 acres. This contemporary barn conversion is situated in a peaceful, semi-rural location on the outskirts of the popular and sought after market town of Clare. The property, which was converted in 2002, offers spacious and flexible living accommodation with stylish kitchen and bathrooms and benefits from a range of useful outbuildings including a home office, gymnasium, store and garage. The property is approached via a private driveway and is set within 0.72 of an acre.